Material polyester 3 piece set includes a matching Vest, Neck Tie and Pocket Square Set Great to wear with a suit or tuxedo -Paisley vest includes a matching neck tie and pocket square -comes with a free hanger Brand New Designed in Italy Vest and NeckTie Set and pocket square. 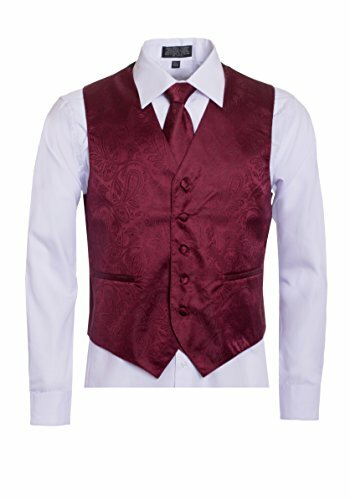 Men's Solid Color Dress Vest with Neck Tie of the Same Color and Made From The Same Material For a Perfect Match. This vest is Available in our listings in the following sizes: XS (Chest Size: 36), S (Chest Size: 38), M (Chest Size: 40), L (Chest Size: 42) , XL (Chest Size: 44), 2XL (Chest Size: 47), 3XL (Chest Size: 50), 4XL (Chest Size: 53), 5XL (Chest Size: 58), and 6XL (Chest Size: 62). Please Checkout Our Other Listings For More Colors and Sizes of Dress Vests and Neckties, Shirts and Neckties. Note: Included Pocket Square / Hanky not shown. If you have any questions about this product by King Formal Wear, contact us by completing and submitting the form below. If you are looking for a specif part number, please include it with your message.